Quiet and secure residence 1300 m2 of land. Our villa is located 20 minutes from downtown Marrakech in a residential complex built by a great architect there 4 years, fully enclosed and secure, not overlooked. The villa is situated on a plot of 1300 m2 closed and trees (olive trees, bougainvillea, palm trees, palm trees, lemon trees, hibiscus ...). The villa has 3 air-conditioned suites (one with TV and DVD player). The suites are all equipped with bathroom. A large living room with fireplace and TV and wifi internet. You can enjoy the roof terrace with views of the Atlas and 2 terraces on the ground floor, facing the pool shaded by more than 8 mx 4 m.
You have near the complex, various activities such as quad biking, camel rides and mountain biking. And of course, you will be close to the biggest Marrakesh Golfs placed within 10 minutes. The tranquility of the villa you will rest a hectic day in Marrakech. You will be able, upon request, to benefit from the services of a cleaning lady and / or cook making your stay more comfortable, relaxing and enjoyable. Bathroom 1 - Toilet, Tub, Bidet Bathroom 2 - Toilet, Shower Bathroom 3 - Toilet, Shower large bathroom decorated in an oriental style with dimmed lights and romantic candlelight. Towels are provided as well as soaps. Beautiful property with views of Atlas mountains from Roof terrace. Spacious bedrooms and plenty of bathrooms. 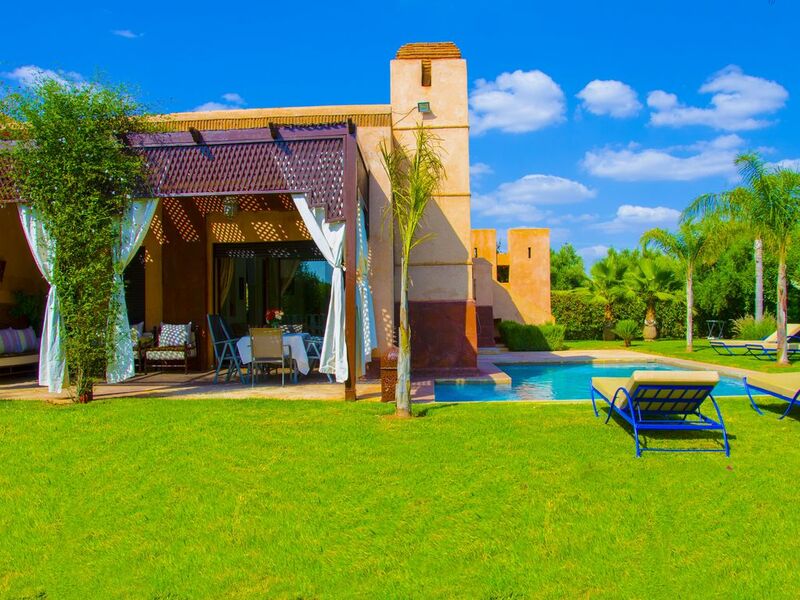 Set in a peaceful and relaxing location 30 minutes away from the hussle of Marrakech. Large private swimming pool. Family had lots of fun. All staff were very discreet and professional who maintained the property. The cook Bouchra was fantastic prepared some great meals. When we arrived she had prepared a Chicken & Olive Tagine which the whole family enjoyed including the kids. There is a large supermarket on the way to Apple Gardens where you can pick up all your groceries and the village Nemero is only a few minutes away where you can buy cheap veg fruit and meat. Also you have a small shop just outside the complex for basics and has lovely local bread fresh everyday. The hotel staff were very helpful with any queries and also the local shop owner Abderahim. The owner Nadia was very helpful with our questions and queries and answered quickly. She gave us lots of local information and arranged our transfer from the airport. Overall a great holiday in a great location in a beautiful home. Very peaceful and relaxing!!! I recently stayed here with a group of friends, the property and grounds were beautiful and the pool was well kept, The villa is located about 20 minutes from Marrakech, however locating the grounds for the first time is tricky as there are very few signs on the location. The Maid service provided by Miriam was exceptional and was an added bonus. It was great having the hotel facilities available to us also. The thing that would have made the experience better was if the pool was heated. This would help when the weather is not so hot during the colder times of year. I would definitely stay here again. Nadia and her husband were very accommodating and are always available to help. Thank you very much for your kind message. You and your friends will always be welcome in our villa. Take care of yourself, we hope to hear from you very soon ! Our villa is close by car from the center of Marrakech, near the road to Fez (National 8). The villa is part of the Apple Gardens Resort & Spa, which was designed by one of the great architects of Morocco. The complex was completed in late 2010 and consists of 51 villas, a 5 * deluxe hotel, 2 clay tennis courts, a children's play area and a small football pitch. The center of Marrakech is a 20 minute drive, where you will have the opportunity to visit famous sites such as the Djemaa El Fna, the souks, the Koutoubia Mosque and the Botanical Gardens. The Atlas Mountains are 1 hour away and are visible from the terrace of our villa. The city has many famous golf clubs around Marrakech, including the Royal Golf Club, the Golf Club Amelkis and Palmeraie Golf Club. It is the combination of the excellent climate and the water from the Atlas Mountains that make fantastic Marrakech area to practice golf. There is currently 5 golf courses in Marrakech with 7 others with licenses granted. The 3 main golf courses have long existed. Firstly, the Royal Golf Club was built in the 1920s and was one of the late King Hassan II favorites. Golf Club Amelkis is the next oldest course. It has 36 holes over 6500 m2 located directly opposite the Royal Golf Club. The third course is well established Palmeraie Golf Club (18 holes, 6,214m2). It is based in the Palmeraie Oasis and, like all other courses here are beautiful and very well maintained. The Marrakech Menara Airport is 4 miles from Marrakech and 30 minutes drive from our villa. And the delights of the city of Marrakech, various activities for the family such as water parks, amusement parks, desert tours, rides a camel or bicycle. Despite the proximity of one of the largest deserts in the world, the water table of Marrakech is abundant and surprisingly green. What may surprise new visitors who often expecting to find a dusty and dirty city. Ski: Marrakech also offers the possibility of using excellent skiing on the mountains of the High Atlas, the ski resort of Oukaimeden, located just over 40 miles by car, one hour from the city . The resort Oukaimeden is usually visited on a day trip from Marrakech and offers all kinds of services. Oukaïmeden was opened as a ski resort in 1936 by the French Alpine Club of Marrakech. It is located at 10,738 feet (3,273 meters) and is the highest ski resort in Africa and the best equipped in Morocco, as well as one of the most popular on the continent. The snow season is quite variable and lasts an average of 120 days / year, from mid-December to mid-March, although snow is quite reliable from January to late March or early April. The ski resort of Oukaïmeden has a relatively small ski area of ​​approximately 300 hectares, but very interesting, including 3 black runs, 8 red, 4 blue and 3 green trails.